Ongoing developments in ultrafast x-ray sources offer powerful new means of probing the complex nonadiabatically coupled structural and electronic dynamics of photoexcited molecules. Absorption of light energy by large molecules is what drives nature: photosynthesis, vision, the synthesis of vitamin D and many other critical processes use light energy to perform their functions. Absorption of light can also have negative effects: overexposure to sunlight damages DNA and can cause melanoma. Nature has developed ways to circumvent such effects. For example, protecting the skin is achieved by efficiently funneling the energy absorbed by DNA back to its initial (or ground) state, in which it was before absorption of light. This process of energy flow, taking place within ultrashort time scales of tens to hundreds of femtoseconds (1 fsec = 10-15 seconds), is universal to all polyatomic molecules. Therefore, identifying the pathways of energy flow is crucial not only for understanding Nature, but also for a large range of applications. The flow of energy proceeds through funnels that are called “conical intersections”. These are points of the molecule’s energy landscape where different electronic energy levels cross. The concept of conical intersections is universally used to explain energy flow in polyatomic molecules. Yet, they have never been observed. Different strategies were proposed to detect them, but at present, none seems experimentally feasible. A team of scientists from the lab of Majed Chergui at EPFL within the Lausanne Centre for Ultrafast Science, the lab of Albert Stolow (University of Ottawa), and the lab of Michael Schuurman (NRC-Ottawa) have now devised an unambiguous approach to detect conical intersections in polyatomic molecules. The approach uses time-resolved X-ray spectroscopy (pioneered by the group of Majed Chergui) that is capable of detecting electronic structure changes with element selectivity, as the energy flows through the conical intersection. 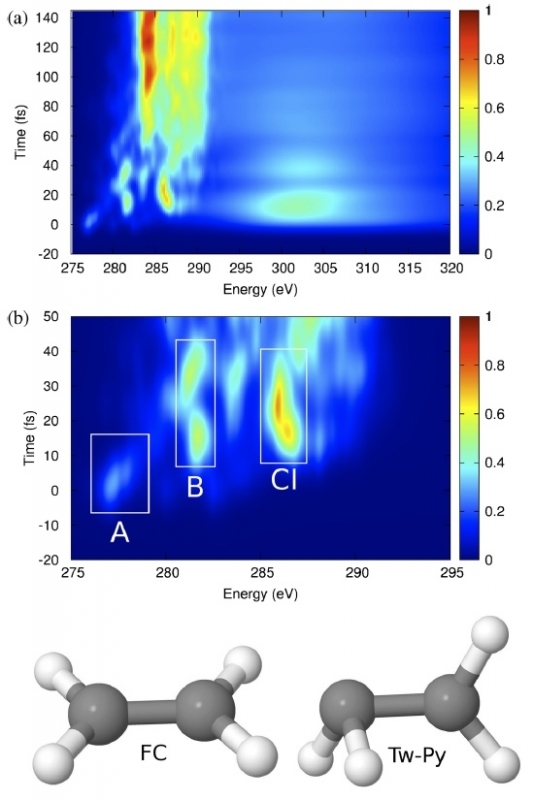 The scientists carried out computer simulations of energy flow across the ethylene molecule, a model for a wide class of molecules of biological interest. The simulations revealed a clear and unambiguous fingerprint of the passage through the conical intersections by a change of charge at the carbon atoms. “Identifying conical intersections is something photobiologists and photochemists have long dreamed of and it opens up new insights for exciting future developments,” says Majed Chergui. FIG. 2. The TRXAS spectrum calculated from AIMS simulations of ethylene excited to its ππ state. (a) The full spectrum showing both the pre-edge and postedge continuum absorption. (b) The pre-edge part of the spectrum at short times and the relevant peak assignments. The features labeled A, B, and CI are directly related to the associated dynamical features shown in Fig. 1. The FC (A) and Tw-Py intersection (CI) geometries are shown below. The color map represents the relative probability of absorption. Reference: Neville, S. P., M. Chergui, A. Stolow and M. S. Schuurman (2018). Ultrafast X-Ray Spectroscopy of Conical Intersections. Phys. Rev. Lett. 120: 243001. (10.1103/PhysRevLett.120.243001) Neville-2018.